Or not? It might surprise you, but not all languages evaluate numbers, empty strings or empty arrays in the same way. Let’s examine several technologies. Python, Ruby, PowerShell, NodeJS and PHP. 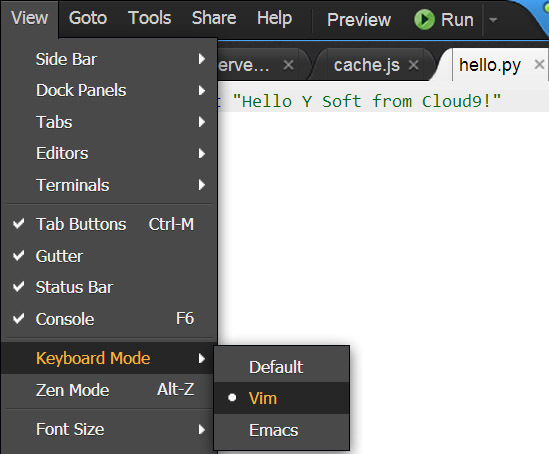 Cloud9 IDE is cloud base IDE for NodeJS, Python, Ruby or PHP projects. Go to View, Keyboard Mode and select Vim. Voila you can use many Vim features, like indentation by >> or many others. You’re not able to invoke any request against Tomcat 7 with https in default configuration. Restart Tomcat and curl will work. Switching between different languages during development of server-client application is daunting task. Jan Volf wrote Pexeso framework. Pexeso is component based, event driven PHP View-Controller framework similar to Adobe Flex framework. Developer can reuse patterns and Flex style of writing code even when coding in PHP.